Becky November 16, 2018 March 27, 2019 No Comments on Andorra: Love It or Loath It? 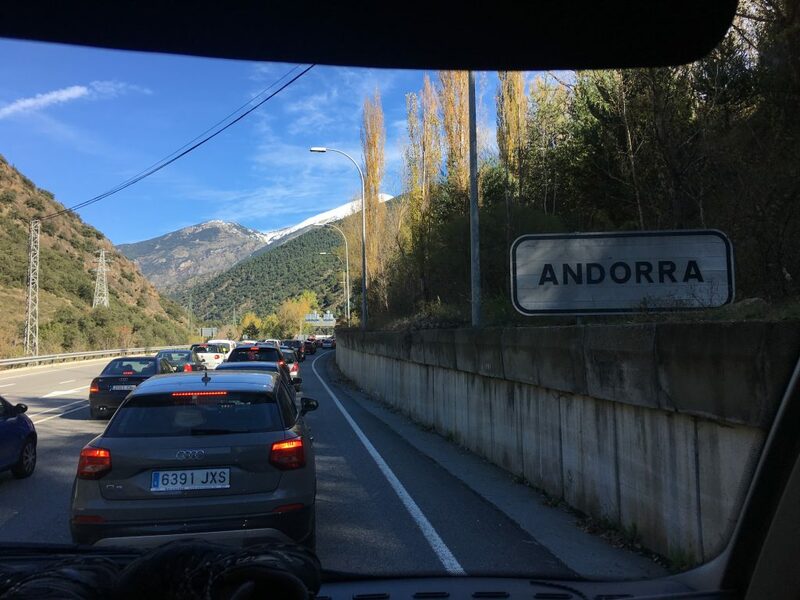 We made a complete misjudgement with our visit to Andorra. We decided to drive there on a Saturday on a Spanish holiday weekend. It wasn’t planned, we had just lost track of the day. We have no excuse, it was obvious from the busy parking area in Ripoll that morning that everyone was out enjoying the long weekend. But we didn’t twig and with no expectation of the journey to come we set off. The journey started well, following the dramatic N-260 up towards the Collada de Toses at 1800m. This drive was spectacular, and supposedly the other side of the col is even more so, but when we reached the highest point we were directed down an alternative route – the road had not yet been cleared of snow. No worries, the alternative road took us past the ski resort of La Molina where we stopped and watched people skiing despite the lifts being out of actions. Lots of families were there with children, giving them a few skiing lessons or just enjoying a bit of sledging. The traffic chaos started just as we turned north onto the N-145, for the next two hours we sat in slow moving queues of vehicles. By the time we got to the turn off for Andorra la Vella, our planned stop for a bit of shopping, we’d had enough. There was no way we wanted to venture near this busy town through traffic that rivalled Italy or the UK. We drove straight on, following the signs to France, until the traffic eased and we could release our pent breath and relax our tense muscles. At El Tarter we saw a large parking area near the ski lifts and decided to park up for the day. It was an ugly car park with little to recommend it apart from the fact it was free and motorhomes were allowed, but sometimes that’s good enough. That afternoon, once we’d recovered, we nosed around the local area a bit, popping into the shops that offered all sorts of alcohol and tobacco – and some that actually offered something else. We tasted cheeses, sausage and ham and picked up some of the nicer cured meat for sandwich fillings. We popped into an outdoor equipment shop and browsed through the contents, mostly last season’s stuff. We wandered around streets of identikit apartments and finally found the few houses of the old village and the tiny church of Sant Pere del Tarter. To try and rid ourselves of anti-Andorra vibes we planned a walk up into the hills the following day. Although there was plenty of snow around it was very clear that the south facing slopes were largely clear of snow, whereas the north facing slopes, untouched by the sun, were still covered with their fluffy white blanket. 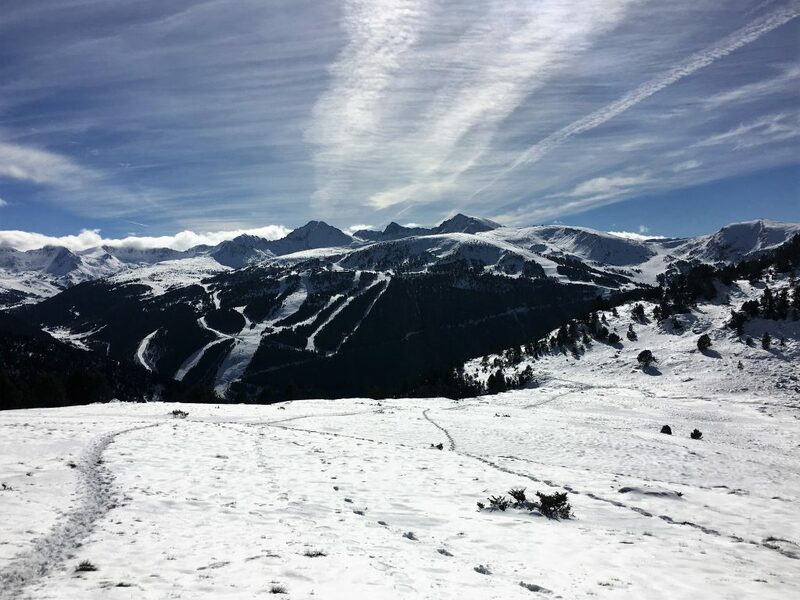 Looking across to the slopes of El Tarter, our parking spot in the centre of the photo – can you make out Bertie? 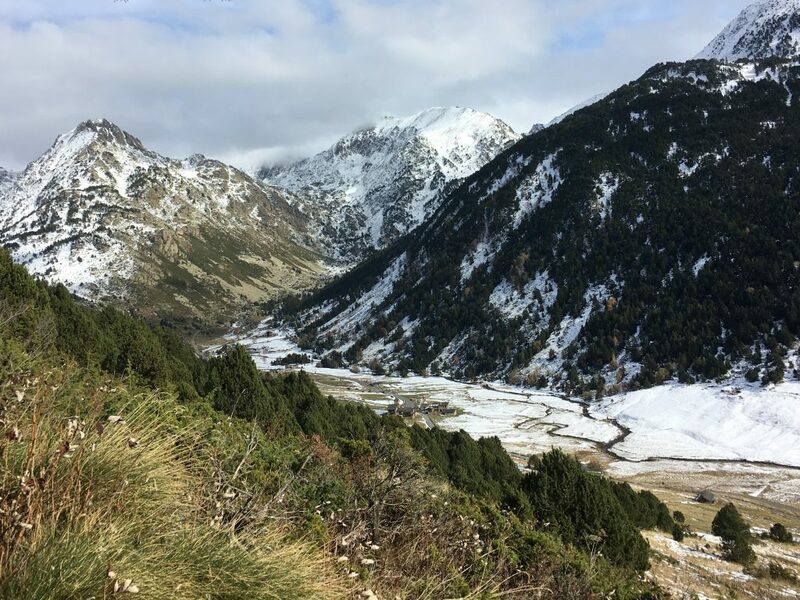 Although our map covered this part of Andorra, it didn’t have many paths marked on the map. We couldn’t work out a decent route and turned to wikiloc for a bit of help. 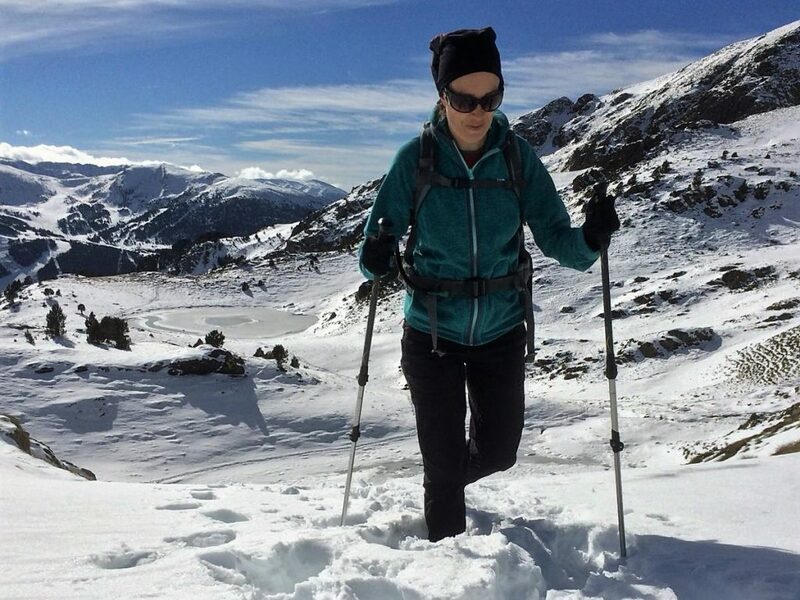 A number of people had recorded the same route on wikiloc, going up to the Estany del Querol and Estanys de les Salamandres. It looked like it would be a well marked trail and we could see a way of making it into a loop by going on to the refuge at Cabana Sorda and then back down the Incles valley. The main difficulty was finding a way from our parking spot to the start of the walk on a road to the north of El Tarter. We could see various trails leading up the side of the mountain, so trusted to our sense of direction (ie go straight up). We went as high as we could along the Cami de la Basera and after the last turn we found steps on the right, leading up the hill. These steps were obviously on the local dog walking route as we found (smelled) Dog Poo Corner, presumably at the point most people would turn around and go back downhill. From here we followed a path that took a couple of zig zags uphill, crossed one road and then deposited us at the start of the walk, well signposted with wooden notices. There was a bit of parking up here but we were glad we hadn’t tried to drive Bertie up. The snow started almost straight away, but the path was clear and easy to follow as it zig-zagged steeply up through fir trees. After about 4km we were out into the open with grand views of snow covered hills in front and behind us. The slope eased off, and although we were now going across the snow it was pretty easy going. On the rise just before the first lake we bumped into a gentleman who had been up to the Estany Querol and pronounced it ‘just perfect’ (everyone speaks such good English! it makes me embarrassed) but said that the ongoing route was too snowy for him. Well that was a challenge wasn’t it! It’s happened to us before, and we don’t like to be beaten. 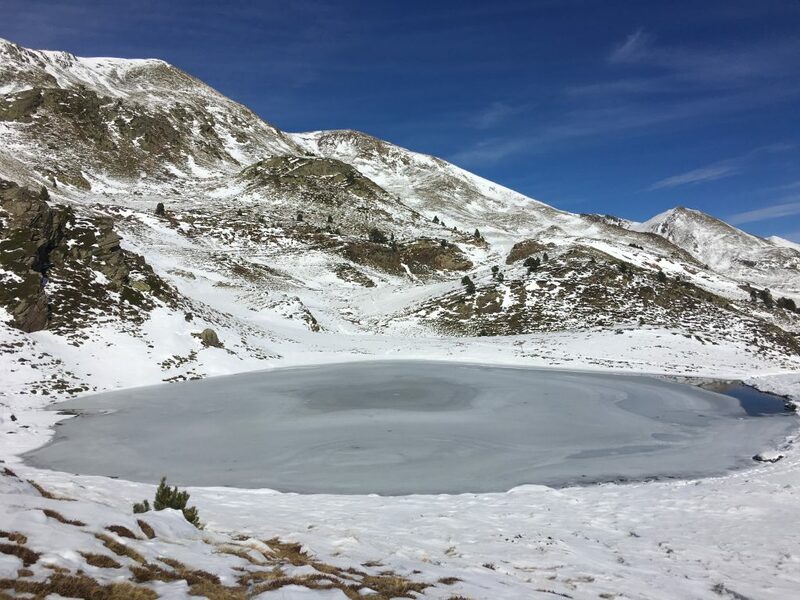 So we made our way to the lake which was indeed very attractive, and from there we followed footprints and signposts to the Estanys de les Salamandres, which were equally as beautiful. After that the snow was deep and unbroken white, no one had been here since the snow had fallen. An occasional route marker was visible but generally we were crossing a featureless terrain. We knew we were heading in roughly the right direction as we took an easterly route down the slope, always sticking to the least steep option. Finally we could see the gorge of the Riu de Cabana Sorda ahead of us. If we stuck to our original plan we would be traversing around a steep slope at this point, taking us to a point where we could cross the river and find the refuge. 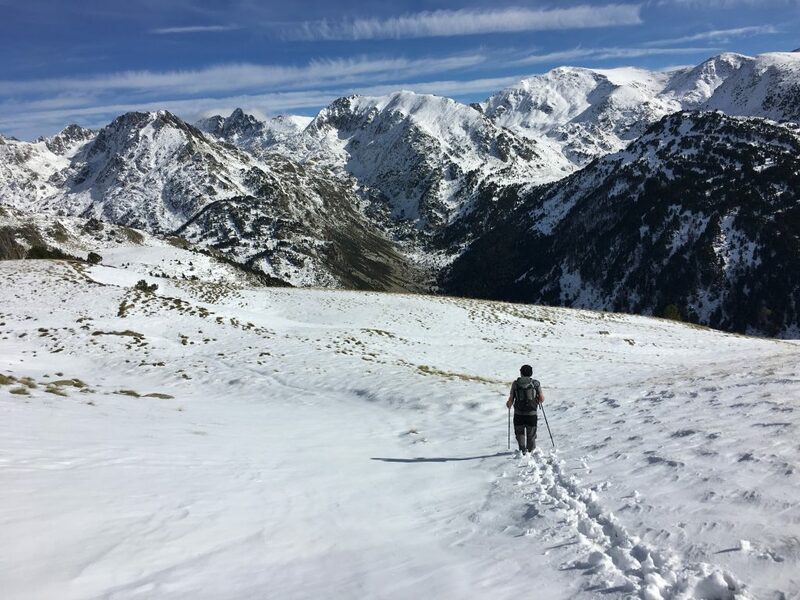 But we didn’t like the look of the slope we needed to traverse, it was steep and snow covered, even if it wasn’t an avalanche risk there was a possibility we would misstep off the path and slip down the hill. We cast about, exploring the more gentle slopes. Our map showed some paths that headed up from the Incles valley towards our position, but they all ended before they got this high. Would we be able to find a path that joined up with them and avoid retracing our steps? Breaking new ground as we try to find an easier onward path. Paul still in a t-shirt! The lucky answer was yes, Paul’s sharp eyes picked up a trodden path below us, looking like it went off the edge of the river’s ravine. We agreed we would walk down and take a look, but turn around if it looked in any way difficult. When we got to the footprints we realised that the path turned away from the edge of the ravine and went in a southerly direction down a rocky path that was mostly clear of snow. It looked like it was going the right way for us, and we happily followed it, feeling relieved. The path took us down into the Incles valley where we could have crossed the road and found a path, but decided that our tired feet would enjoy a bit of even tarmac for a change. This valley really was pretty, not just because we had actually made it in one piece, it’s southern aspect made it a little sun trap, warm and sunny but surrounded by white peaks. 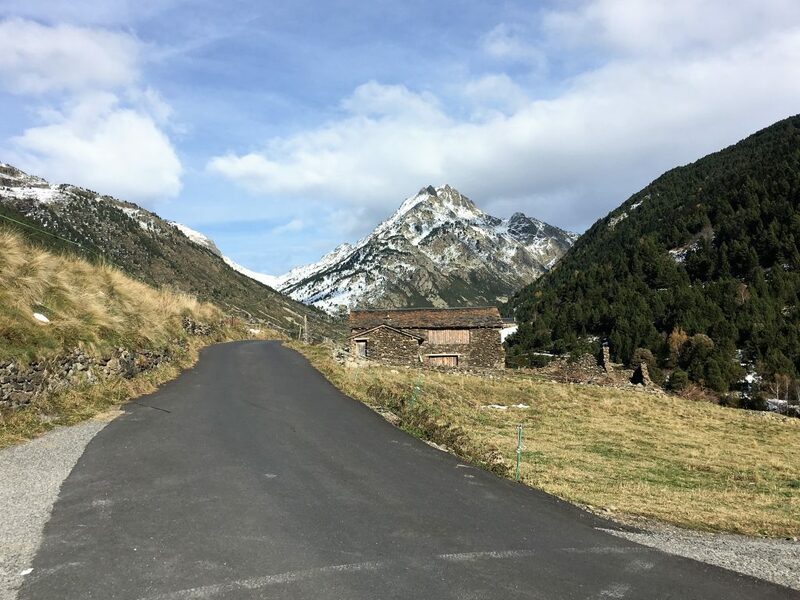 As a contrast to Andorra’s main road there was very little development and traffic here, making it relaxing and peaceful. Sadly we had to leave this oasis and walk two kilometres down the main road to get back to Bertie, but it was a fair price to pay for an enjoyable and exciting walk. We decided that the walk had enabled us to put our unpleasant traffic experience behind us. 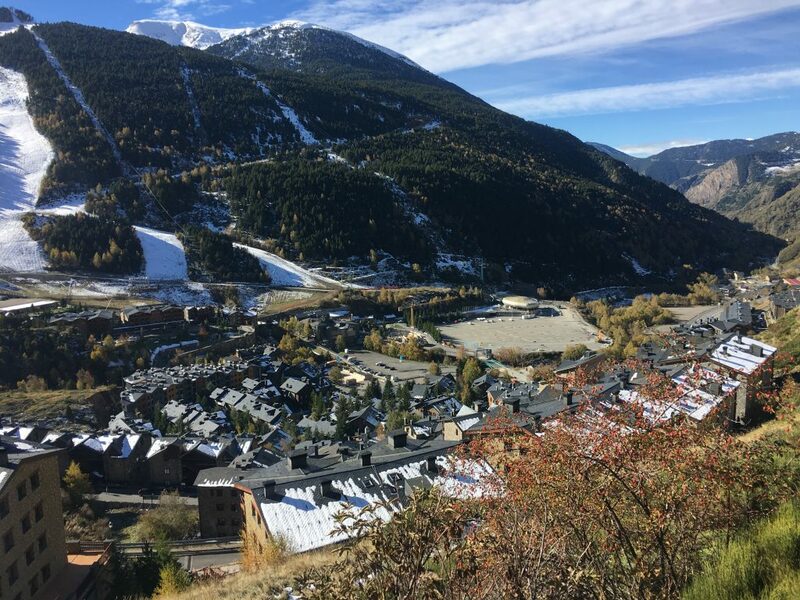 We wouldn’t be running away from Andorra but would spend a bit more time (and money) here.